The closed low pressure area continues to move slowly eastward and is now just off the Northern California coast. This system will move across Northern California later today with scattered showers and thunderstorms. The low will be east of our area by midday Sunday and skies will be clearing. 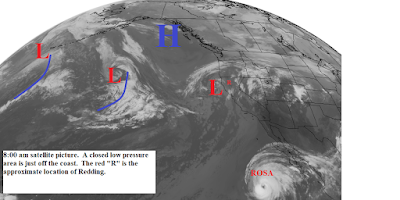 Monday another low pressure area will approach the coast but it slide southeastward and move inland over Southern California on Wednesday (see map below). We will see clouds from this system Monday with a few showers Monday night and Tuesday. Temperatures today through Wednesday will be below normal. Gusty south winds will occur today and again on Monday. Late next week high pressure will rebuild along the west coast for a return of warm and dry weather.